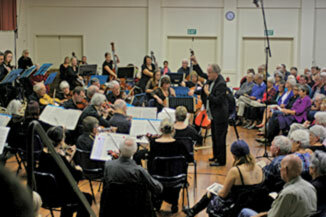 The Otaki Memorial Hall was filled to capacity — audience members almost sittingamong the double bass players — at the recent Kapiti Concert Orchestra’s Pieces for Peace concert with the Otaki Community Choirs. Leading New Zealand conductor, Kenneth Young was in full “control” of the 80 member orchestra, guiding them through the afternoon’s performance, with guest cello soloist Inbal Megiddo. For this concert and the number of people and their instruments, the orchestra was set along the west wall of the hall, with the choir of 30 plus choir singers in the corner near the stage. The audience “overflow” was on the stage, where they had a wonderful view of the whole orchestra in action, but did lose some clarity of sound of the choir, being behind them. The concert opened with the well-known Crown Imperial by William Walton. This was first performed at the coronation of King George VI in 1937; it was thereafter known as the Coronation March. It was played again at Queen Elizabeth II’s coronation in 1953 and it was the recessional piece played at the wedding of Prince William and Kate Middleton in 2011. This was followed by Edgar Elgar’s Concerto in E minor Opus 85 for cello and orchestra with soloist Inbal Megiddo, which was well received and applauded by the audience. The second half began with four pieces, George Butterworth’s A Shropshire Lad rhapsody, Elgar’s Chanson de Matin, Fantasia on Greensleeves by Ralph Vaughan Williams — this uses the tunes Greensleeves and Lovely Joan, with Eric Coates’ London Suite bringing the orchestral only part of the afternoon to an end. The Otaki Community Choirs, under the directorship of Ann-Marie Stapp, sang three well known songs — We’ll Meet Again and The White Cliffs of Dover both very popular during World War II and It’s a Long Way to Tipperary which was popular with the World War I soldiers. This final of orchestra and choir had the audience joining in singing the choruses. The conductor, Mr Young appeared to enjoy this bracket as he turned each way bringing in the musicians, singers and audience in a relaxed performance and with a smile. The only downside to the afternoon was late-comers being permitted entry to the hall at the end of the first movement of the cello concerto, with a lot of banging of chairs as the front of house people endeavoured to bring in extra seats. The conductor was notamused. Overall, it was a great afternoon, enjoyed by all, from the younger children to those in their 80’s and olderamong the audience of over 250.